On 6 July 1918, the day after making a brief attempt to set Samain’s La grenouille (The Frog, RC 143*) to music, Diepenbrock turned to another poem from the collection Aux Flancs du Vase (The Vase’s Side): Le sommeil de Canope (The Sleep of Canope). This time it resulted in a sizeable fragment of what might have become a mature composition: an introduction of 7 measures and a complete setting of the first four lines. The topic of the poem is in keeping with the themes of many of Diepenbrock’s other songs: the dreamy mood of two lovers, sitting on a terrace looking out over the sea at dusk; the immense, peaceful silence with only the occasional soft noise in the distance; Canope has fallen asleep with her head on Alcis’ shoulder, her face hidden behind her golden hair; the waxing moon and the twinkling stars, the murmuring sea – this whole picture evokes a mood of languid intoxication and tenderness which enraptures Alcis. He shudders, bends forward and observes his beloved for a long time. Finally he presses a kiss on her red lips. But suddenly his heart appears to break when he realises that he will never experience all this again: that combination of delightful peace, night and silence, friendly sea, and the kiss he has given Canope while she is sleeping. The opening of Diepenbrock’s composition reflects the tranquil and sensual atmosphere of the text. Descending chromaticism plays an important role. 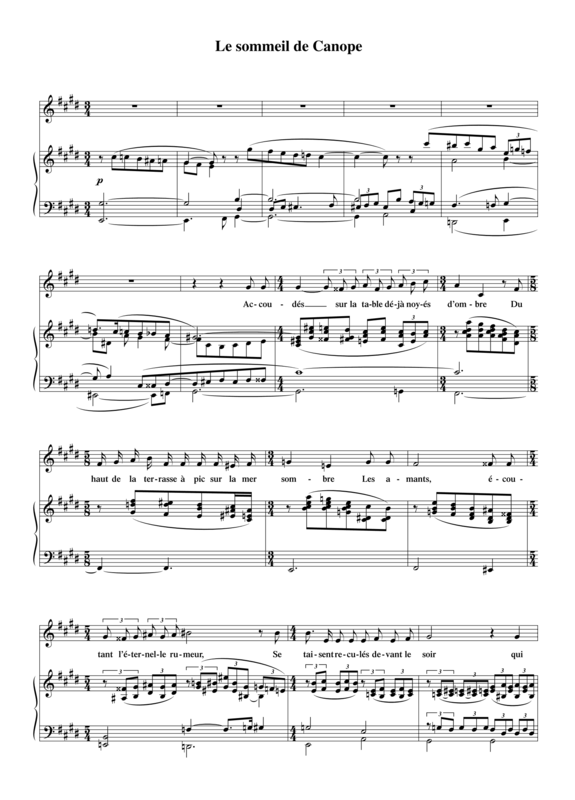 The great distance between the independent melodies in the introduction, which can hardly be played on the piano, indicate that right from beginning Diepenbrock had intended the song for voice and orchestra. So unsurprisingly there is also a second sketch of the first eight measures with an arrangement for flutes, oboes, clarinets, bass clarinets, horns, violas, cellos and double basses. Se taisent, recueillis devant le soir qui meurt. Alcis songe, immobile et la tête penchée. Comme un fardeau trop lourd glisser son front charmant. Ce soir, se fait plus doux de passer sur les roses. Semble élargir jusqu’aux étoiles sa tendresse ! Et tout à coup son cœur semble en lui se briser ! Et ce baiser, dans l’ombre, à Canope endormie.